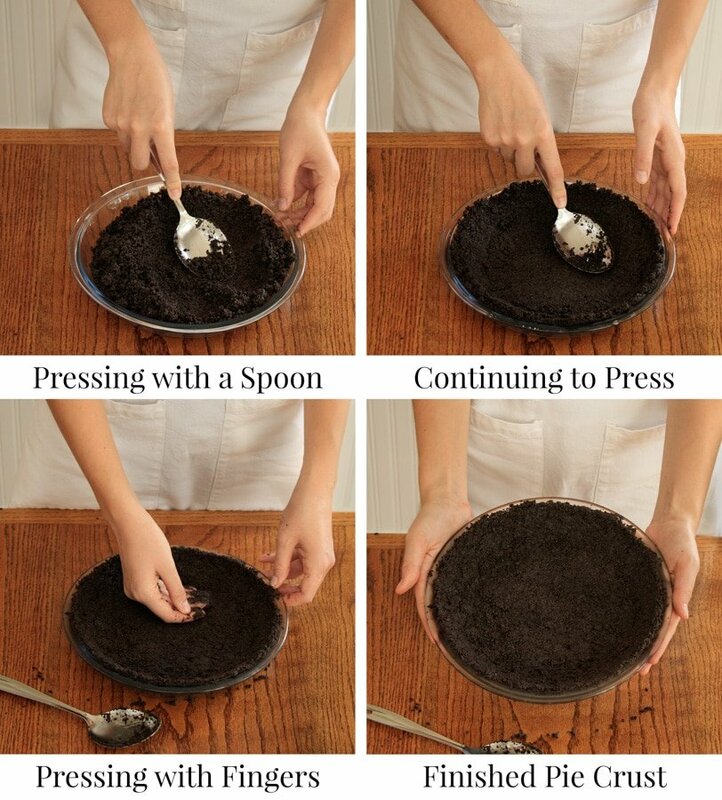 Learn how to make an Oreo pie crust with step-by-step photos that illustrate this fun and easy recipe. It only takes 2 ingredients and a few minutes of prep time! If you’re like me, I frequently use a store-bought Oreo pie crusts for my no bake pies. 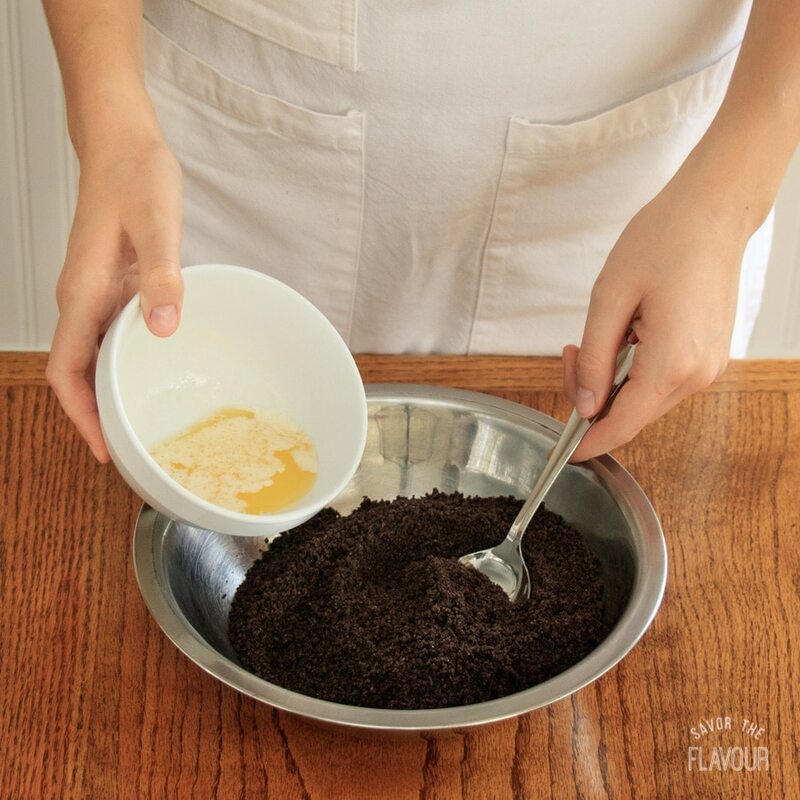 But surprisingly, it’s really easy to make your own Oreo pie crust at home. Whether you don’t have time to run to the store, or just want the satisfaction of making it yourself, it’s fun and easy to make, so let’s do it! Start with 24 Oreo cookies, including the cream filling. Dump them into the food processor, blend until they turn into fine crumbs, and then pour them into a bowl. Pour in 4 tablespoons of melted, unsalted butter and stir really well to combine. Press the crumbs into a 9-inch pie plate with a spoon at first, then your fingers. Make sure to pack down the crumbs evenly all over, even on the sides. Then, chill the pie crust for 1 hour before using. This gives the pie time to set as the butter hardens in the fridge. Eight steps, with eight pictures. It’s that simple, guys! Ready to give it a go? ☺ Round up a little helper and the two of you can have some bonding time over pie. If you need a recipe to go with this Oreo crust, try our refreshing frozen peppermint pie. Its cheesecake-like texture will have you hooked! 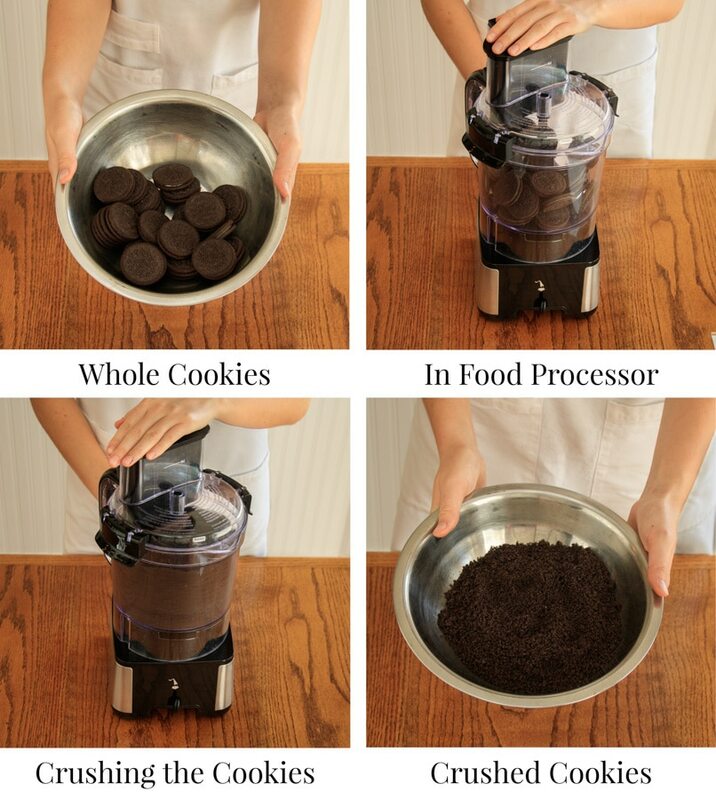 Crush the cookies in a food processor until they turn into fine crumbs. Pour the crumbs into a bowl and mix in the melted butter. Press the crumbs into a 9-inch pie plate, using a spoon and your fingers. Make sure the crumbs are firmly packed in an even thickness around the base and sides. Chill the crust for 1 hour before using.